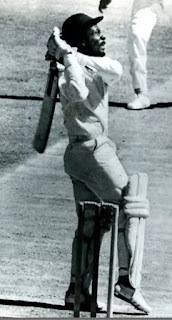 In social media - Anwar ali smashing Wahab riaz for a 6 but getting out too in PPL was circulated .. .. that brought in remembrances of the final of World Cup 1975 against Australia at Lord’s, Fredericks tried his forte, the hook, on Dennis Lillee. The shot was timed so well that it soared over long-leg dispatching the ball landed outside the ground into St John’s Wood Road. However, he trod on the stumps and was out hit wicket. Roy Clifton Fredericks was considered a devastating leftie, remembered more for that blistering match-winning knock of 169 on a lightning fast pitch of Perth in Dec 1975. It came against the pride and power of Aussie bowling attack that had Dennis Lillee, Jeff Thomson, Gary Gilmour and Max Walker. His innings had his trademark hook shot and at the same time beautifully timed cuts and the cover drive. He reached his century off just 71 balls, the second-quickest of that time after Jack Gregory’s 67-ball assault. He went on to make 169 off 145 deliveries. 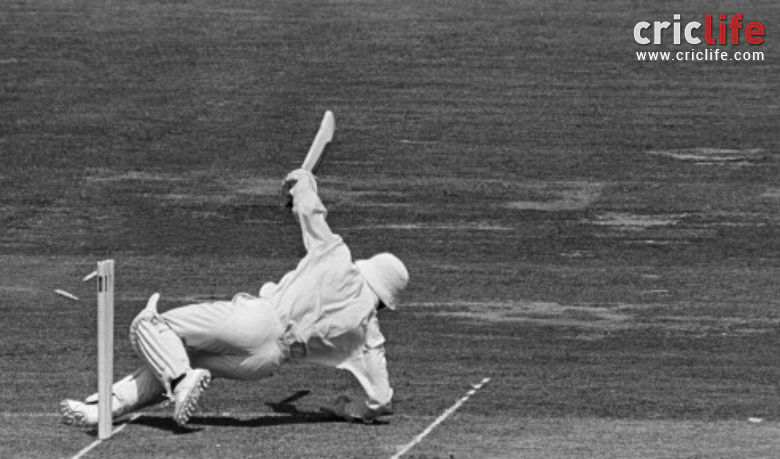 However, Australians won the series 5-1 and this was the only Test that the West Indies won. At lunch West Indies had hit 130 for the loss of Bernard Julien's wicket. Just 14 eight-ball overs had been completed: much of the time had been lost retrieving the ball from the stands and where it had rested far beyond the eastern rope. West Indies' 200 came in just 22 overs and Freddo was out for 169 (caught by Greg Chappell at second slip off Lillee) with the score at 258. We had seen Roy Fredricks as he came on in that Clive Lloyd tour and played at famous Pongal test in 1975 at Chepauk scoring only 14 & 19. However, a batsman cannot be out hit wicket on a no ball ! ~ but can be out Hit Wicket, Run out or stumped in a Wide. Roy Fredericks, the Guyanan cricketer considered one of the best opening batsmen is no more, having died at the age of 57. On that tour of 1975 Gordon Greenidge and Viv Richards (along with Hemant Kanitkar) made their test in the 1st test at Bangalore. Greenidge forged a formidable opening partnership later with Desmond Haynes. Fredericks made his Test debut in the 1968-69 series in Australia and played 59 Test matches for the West Indies. In some ways for the WI fan, such history should bring more happiness than the present performance which touched another new nadir in the Super Sixes – 21st match in ICC World Cup Qualifiers at Harare, Mar 15 2018. The score card of a strong WI lineup boasting of Chris Gayle, E Lewis, Marlon Samuels, Jason Holder, R Powell, Craig Braithwaite made 197/8 and were beaten by Afghanistan by 3 wickets ! .. .. Afghanistan nearly bottled what should have been a straightforward chase of 198, but the insurance provided by the brilliance of their spinners just about bailed them out in their Super-Sixes clash against West Indies. Throughout the 47.4 overs that the chase lasted, it always seemed like Afghanistan would pull this off one way or the other. And yet, they never managed to eliminate the apprehension that accompanied as one batsman after the other perished in their dash towards an early finish. The other minnows were to bask in glory as Nepal claimed ODI status for the first time with their six-wicket win over Papua New Guinea. Dipendra Singh Airee was front and centre on this historic occasion, claiming 4 for 14 to knock the opposition over for 114 and then leading the chase with a 58-ball half-century. Paras Khadka's men had to thank Netherlands though, whose defeat of Hong Kong, meant that they will now be playing with the big boys. There were several notable events that studded this triumph for Nepal, not least of which is the fact that their cricket board is currently suspended by the ICC. Their arrival to the World Cup qualifier was also a spectacular story, with the team claiming several nail-biting last-over finishes. A team that was in Division Five in 2008, alongside Afghanistan, have now risen to the top-tier of international cricket. Papua New Guinea, who lost all four of their group games in the tournament prior to the consolation bracket loss to Nepal, have lost their ODI status along with Hong Kong. Both teams have now been demoted to WCL Division Two, but they do have one final chance to play an ODI (at least until 2020) - the ninth-place play-off on Saturday.